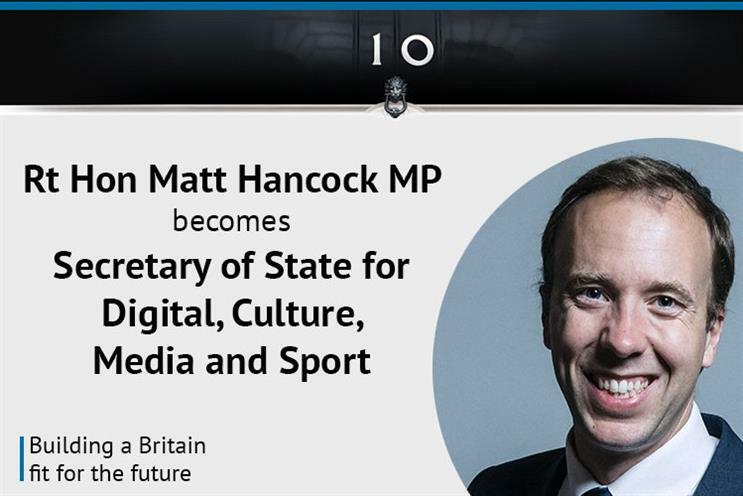 Digital minister Matt Hancock has been promoted to secretary of state for digital, culture, media and sport in the latest government reshuffle. Hancock succeeds Karen Bradley, who had been his boss since both were moved to DCMS when Theresa May became Prime Minister in July 2016. Bradley is moving to replace James Brokenshire, who resigned for health reasons, as Northern Ireland secretary. Hancock, the Conservative MP for West Suffolk, tweeted he was "thrilled" to become DCMS secretary. Last night he tweeted pictures of himself rubbing shoulders with celebrities Rita Ora and Dermot O’Leary at a dinner for London Fashion Week. As culture secretary his ministerial brief will be dominated by the impact the UK’s exit from the European Union will have on the creative industries. However, the most immediate issue will be whether the Competition and Markets Authority decides to block 21st Century Fox’s £11.7 billion bid for full control of Sky. A decision is expected later this month, with the added wrinkle that Disney may or may not pursue the deal when it completes its $66bn (£49bn) takeover of Fox. There will also be strong lobbying from Channel 4, against attempts by the government under Bradley to move the broadcaster's base, at least partly, outside of London. The 39-year-old entered the government in 2010 as a skills and enterprise minister, before moving to the energy portfolio in 2014. In 2015 he was appointment as the paymaster general and minister for the cabinet office. Jon Mew, the chief executive of IAB UK, described Hancock as a "proactive and forward thinker". "Matt’s worked closely with our industry in his previous role and is well-versed with the issues facing digital advertising, as well as being a great advocate of the industry’s ability to effectively self-regulate," Mew added.